To be honest, I liked this far more than I expected going in. Then again, knowing nothing about the author, I was expecting a book coming out of a “bunker mentality.” Thankfully, this (and he) is nothing of the sort. Yes, we sometimes take a lot of grief for being Christians (although far less than people in other parts of the globe), and this book certainly addresses that. But rather than using that fact as an exhortation to be more combative or to brush up on apologetics that in truth preach largely to the converted, R.T. Kendall encourages to take a more biblical view: Follow Jesus wholeheartedly, and rejoice for being counted worthy to take grief from others for something that basic—even sometimes from other Christians who resist and resent seeing a new work from God. R.T. Kendall. 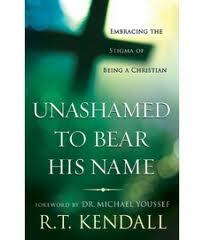 Unashamed to Bear His Name: Embracing the Stigma of Being a Christian. 208p., $13.99, Chosen Books. And by the way, shame on me for not knowing recognizing the name R.T. Kendall, senior minister for Westminster Chapel in London for a quarter-century. Kendall also takes us through some historical perspective, both biblically and in terms of church history, to further prove his point. (Remember kids, the terms Methodist, Quaker, and Nazarene—let alone Christian—weren’t always met with a modicum of social decorum.) Time is also spent late in the book on dealing with certain unpopular but nonetheless thoroughly orthodox doctrines (namely, creation, predestination, and hell). I particularly appreciated the call, especially present throughout the second half of the book, to minister in both word and spirit, as most churches tend to emphasize one to the near-exclusion of the other. The final chapter is an invitation to come “outside the camp”—to follow Jesus no matter what the cost or the stigma, nor whether that stigma comes from inside or outside the church. New works of the Spirit are almost always going to cause friction with the established order, Kendall suggests; get used to it, and rejoice in what God is doing. Let God’s works replace ours. This is a book I’ll be coming back to. But you can take your first crack at it right now. This entry was posted in Uncategorized and tagged book review, evangelism, persecution. Bookmark the permalink.